My fondness for reading, writing and communicating through the written word is all about learning and teaching. The text itself, however, has also become a graphic element that I'm so drawn to in my creative pursuits. Text began to appear in my home decor years ago, found it's way into my wedding theme (which I'll have to share one of these days), then began to seep into my art, now the wearable kind. I hand wrote another scarf for a dear friend's birthday today. This time I chose a beautiful poem by Hafiz, a 14th century Persian poet. I also included pieces of inspiring text from the Desiderata, by Max Ehrmann. I'm hoping it will make her smile and add an interesting accessory to her wardrobe. As a design element and a source of meaning and inspiration, writing is a form of expression that has found a permanent place in my art. 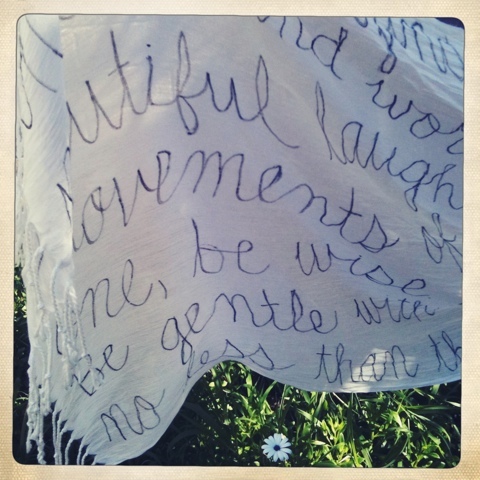 See more photos of the text scarf project and learn how to make your own here.